Eliminate Cellulite at the source using local anesthesia and reduced recovery time. 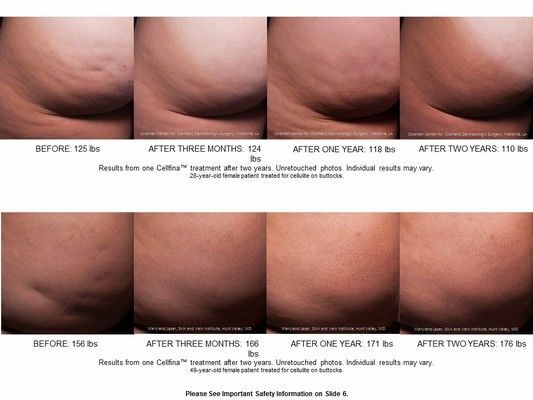 One of the newest and most sought-after procedures for reducing visible cellulite is Cellfina™. What makes Cellfina™ different is it treats the primary structural cause of cellulite – the connective bands woven throughout fat in the thighs and buttocks. Cellfina™ is a minimally invasive procedure, using a small needle-sized device to break the cellulite-causing bands just beneath the surface of the skin. With Cellfina™ we have the option to treat several areas in one visit, all while using local anesthesia. One of the greatest benefits is the limited downtime most patients experience. Results can be seen in as little as three days, and patients can resume normal activity almost immediately. We are among the first to offer Cellfina™, and have seen incredible results on the many patients we have seen. Greenberg Cosmetic Surgery is excited to be on the forefront of providing the latest technology and procedures. Cellulite occurs when bands of connective tissue beneath your skin harden, while surrounding fat cells increase in size and push upward, resulting in the dreaded “cottage cheese” effect. Genetics, hormones, and weight change can contribute to one’s tendency to develop cellulite, but the cellulite itself is caused by fibrous bands pulling the surface of the skin inward to create dimples. For many, that means taking extra measure to cover up or wearing clothes that don’t necessarily reflect their own personal style. The advantage of Cellfina™ is a quick and effective in-office procedure that provides long-term results. Contact our office today and schedule your complimentary consultation! Cellfina	Overall rating:	5	out of 5 based on 31	reviews.